Renting an apartment could go two ways: extremely well or very poorly. Here are some Questions and Answers that will help you rent an apartment efficiently. Q. Where should I start looking for a rental apartment first? A. I would suggest searching the area that is closest to your place of employment. Living in a rental apartment that is nearby could help you cut back time commuting. Depending on proximity, you might even be able to walk to work. Q. What if the apartments next to work are in a location that is undesirable for me, or they are not enough space? A. Going a little bit further outside of the community where you spend most time could be beneficial. Try finding open houses and viewing properties in different neighborhoods and see how they compare in size. Q. How much should I spend on rent per month? A. This depends on the amount of money you make, if you are going to be sharing expenses with others and how much you normally spend on going out or entertainment. If you have an expensive lifestyle that you wish to maintain, you might not be able to afford getting into the penthouse suite. Compromising is the best solution to ensure you can cover rent, plus other expenditures. Q. Is it a good idea to rent an apartment with only a verbal agreement? A. This is never a smart or good idea. Before getting into any kind of rental, it is wisest to have documentation on the terms. You have to make sure everything from the price of rent to length of lease is written down and signed by you and the landlord. A verbal agreement will not be held seriously in court if need be. Q. I have no furniture for my rental apartment, when should I purchase it? A. The best thing to do with furniture is to go to the apartment first and gather the dimensions. You need to be able to find furniture that is suitable for the size of the unit your are in. it doesn’t make sense to buy a huge comfortable couch only to find that it won’t fit through the front door and will take up most of the space of the floor. Q. What if I want to rent a furnished apartment? 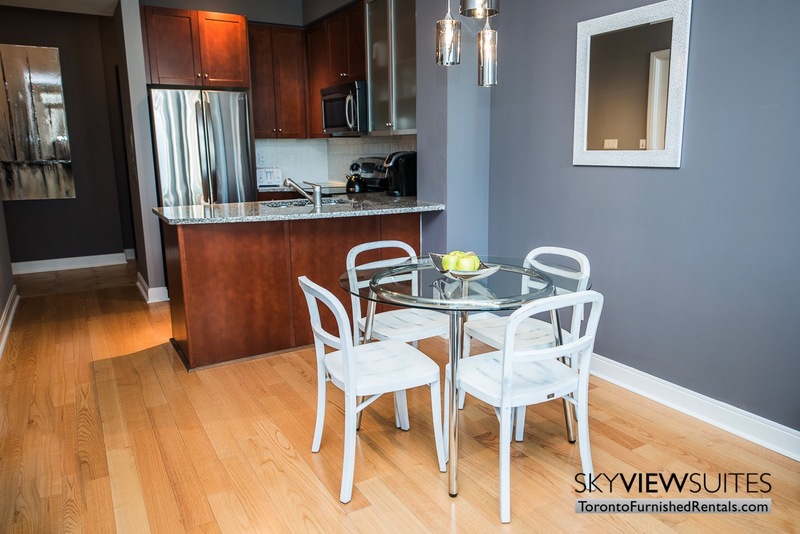 A. SkyViewSuites www.torontofurnishedrentals.com have units that are move in ready. We pecialize in furnished apartment rentals in Toronto and can accommodate your rental needs.